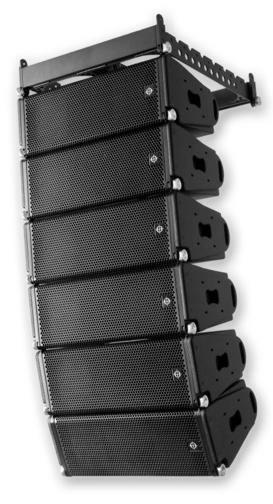 Always seeking to design and manufacture systems that deliver the very best possible audio quality, Coda Audio’s latest mission has been to design the first truly compact three-way line array. That mission came to a successful end with the introduction of ViRAY which will be showcased at ISE 2013, in Amsterdam, Hall 7 C-210. With a maximum hang of 24 cabinets, ViRAY’s compact, high output enclosures can be used as single units as well as in multiple arrays, maximising the efficiency of the product and allowing it to be equally as at home at FOH or as a sidefill / infill system, suitable for both touring and fixed installations. With all components designed and manufactured in-house, as with all Coda Audio products the design began with the key components, and ViRAY incorporates Coda’s all new DDP Dual Diaphragm Planar-wave-driver Technology. This patented new double diaphragm transducer is a result of extensive research and development, which has resulted in dramatically improved dynamic response, clarity and transparency. It balances with two 8” neodymium ultra low distortion cone drivers for the LF section, which feature high flux linear motors with triple demodulation rings, achieving lowest possible distortion and providing increased power handling. All ViRAY drivers are loaded to a common ViCOUPLER, which combines the energy produced from all transducers allowing them to perform as a single source, without phase destruction, thus achieving a coherent and uniform wavefront. In fact, the ViCOUPLER determines the horizontal on-axis and off-axis frequency response. The ViCOUPLER technology integrates a waveguide for the Mid/High planar wave driver, aarge plane screen panel to avoid backwards reflections, and a phase plug for the 8” drivers for optimized loading. ViRAY also features a user-selectable horizontal dispersion pattern of 120° / 80° or asymmetrical 100° (60°+ 40°) or (40°+ 60°). Vertical coverage is array dependent from 0°-10° in 1° steps. The system design allows for a vast increase in ground-stacked configurations, as well as in flown arrays. ViRAY has a frequency response of 55Hz - 22kHz and, for extended bass response, is complemented by the optional SCV-F, which utilises Coda Audio’s Sensor Control technology to turn the two elements into one unified system. SCV-F may be used in Omni or Cardioid formats and can be flown in curved arrays, allowing full system flown applications to be completely coherent in all respects. The ViRAY multiplex enclosure is finished with a Polyurea coating for durability and water protection. A complete accessory suite includes flybars and dollies (which allow cabinet angles to be set before use and transported without change), weather resistant protection covers and flight cases.